Islamic State terrorists take most of Yarmouk 'refugee' camp; clashes still ongoing. 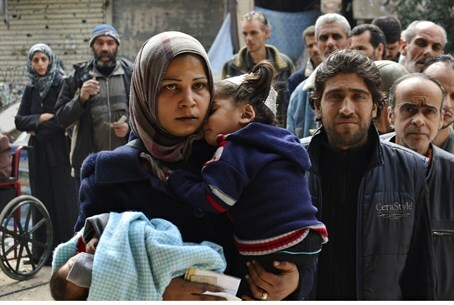 The Islamic State (ISIS) jihadist group seized control of most of the Yarmouk Palestinian refugee camp in southern Damascus Wednesday, a local Palestinian official told AFP. "Fighters from IS launched an assault this morning on Yarmouk and they took over the majority of the camp," said Anwar Abdel Hadi, director of political affairs for the Palestine Liberation Organisation (PLO) in Damascus. Fighting was continuing inside the camp, he said. The Syrian Observatory for Human Rights, a Britain-based monitoring group, said ISIS was in control of a "large part" of the camp after fighting with Palestinian groups also opposed to President Bashar al-Assad's regime. Yarmouk was once a thriving neighborhood home to 160,000 Palestinians - descendants of refugees from the Arab-Israeli conflict, who uniquely allowed to "inherit" refugee status by the UN - as well as many Syrians, but has been caught up in the country's fighting and besieged by regime forces for more than a year. Only about 18,000 residents are estimated to remain in the camp after many fled the fighting. Syrian rebels had withdrawn from the camp in February 2014 under a deal that left only Palestinian anti-regime groups inside. The siege has caused significant shortages of food, water and drugs inside the camp. ISIS, which has seized control of large parts of Syria and Iraq, has fought not only against the Assad regime but also against other rebel groups as it seeks to expand the territory under its control.